Gulfport-Biloxi International Airport has completed a 40,000 sq. ft. air cargo facility. The cargo facility includes 20,000 square feet of chiller space, 20,000 square feet of cargo sorting and distribution space, and 6,000 square feet of office space. Airside access from the runway system has been designed with safety and efficiency in mind. The ramp can facilitate two MD11s or DC10s or one B747. The area is also expandable with 120 acres reserved for air cargo on airport. Centrally located on the Gulf Coast of Mississippi, our international airport and port facilities provide immediate access to the Interstate highway system. Cargo entering the USA at Gulfport-Biloxi (GPT) saves 24 hours of highway transit time to reach the Gulf South and Middle America, and time is money. Gulfport-Biloxi International Airport, and its related port facilities, are low cost, un-congested and customer friendly. Our air cargo facility operator, Gateway America can handle, clear, consolidate and distribute your products throughout North America and has a primary focus on perishables. And what’s most important, this can be done faster, cheaper and with your customer’s best interest in mind. Finally, there is an alternative! More than 5,000 acres are available for businesses seeking Foreign Trade Zone tax advantages. FTZ No. 92 sites provide access to the Gulf of Mexico, the Intercoastal Waterway, Rail and Interstate Highway Systems. 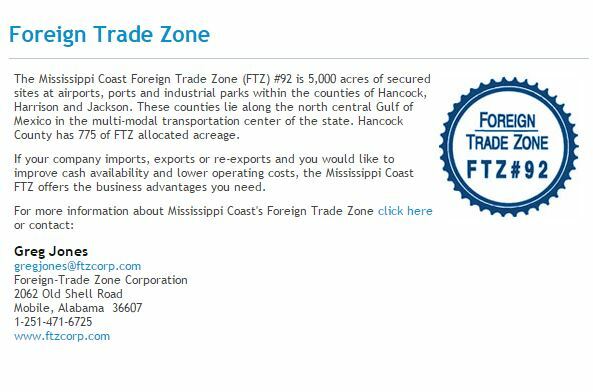 For more information on the Mississippi Coast Foreign Trade Zone click here.